Most of us once believed that all human beings wanted the same things we wanted: Love. Stability. Success in some field of endeavor. Fulfilling relationships with family, friends and co-workers. We did not realize that some people, even though they looked just like us, did not care about these things at all. I learned this lesson the hard way. My ex-husband promised to love me forever. He promised that if I stood by him, I would not feel the potholes in the road of life. He lied. The road he put me on was a high-speed expressway, heading right for a cliff. That’s why I launched Lovefraud.com to teach people how to recognize and recover from sociopaths. 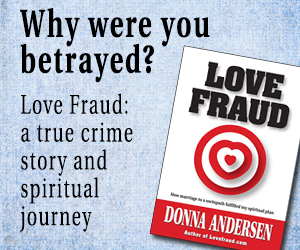 Lovefraud now receives nearly 80,000 visits per month. Many readers are desperately trying to get off the same expressway I was on before they go over the cliff. 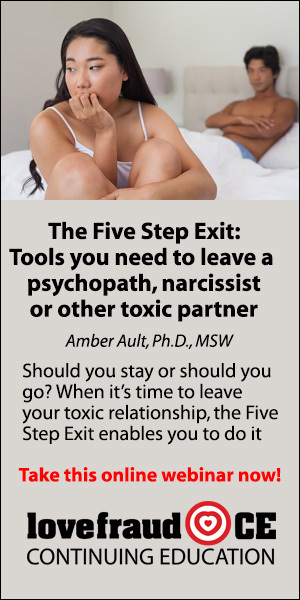 Lovefraud.com explains the crazy-making behavior of sociopaths and helps you realize that you must escape them. But to do it, to actually take steps to end the entanglement, you often need help from experienced and savvy professionals. The goal of the Lovefraud Professional Resources Guide is to link the people who need support with the people who can provide support. 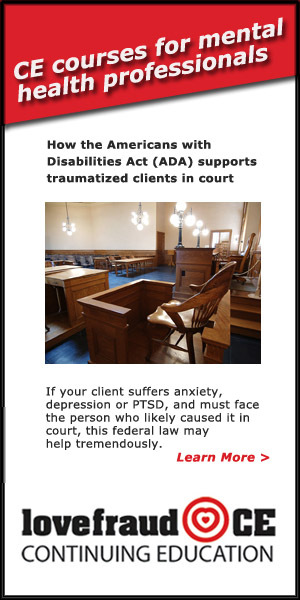 It is a directory specifically for service providers who understand disordered individuals, how to deal with them, and how help you recover. 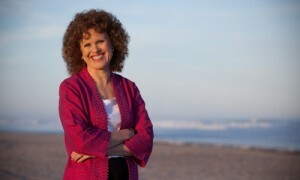 The professionals in the directory create their own profiles, describing how they can serve you. You can search the directory by specialty and by location. To contact a professional, you can send e-mail directly from the form on his or her profile page. To search the Resources Guide at any time, click the link in the red menu bar at the top of the page. 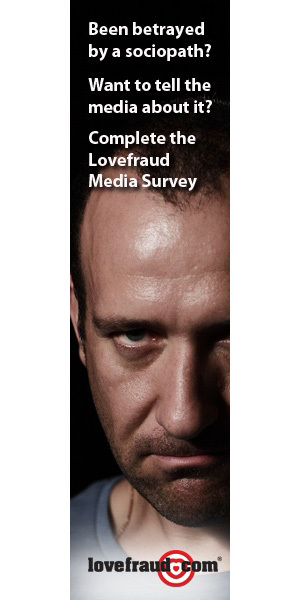 You’ll notice that, at the moment, the Lovefraud Professional Resources Guide is fairly small. Will you help build it? 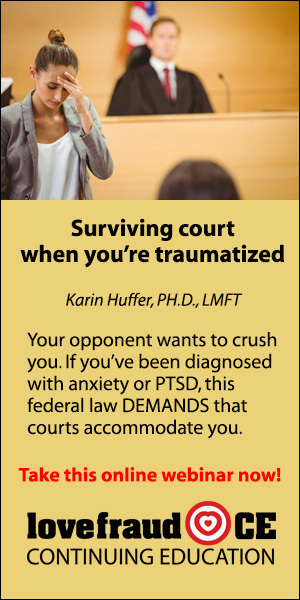 If you’re a therapist, lawyer or other professional who can help people escape sociopaths, please become a member. Listings are inexpensive. And listings for bona fide social service agencies are free. 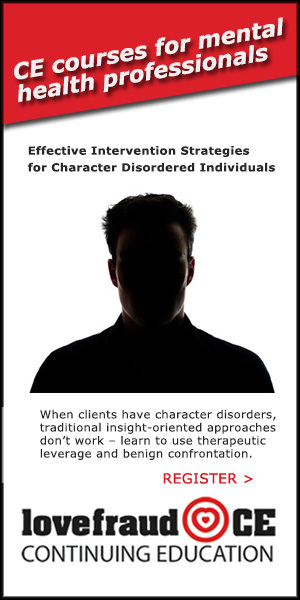 If you’ve found a therapist, lawyer, agency or another professional who “gets it” about sociopaths, please ask that person to join the directory. 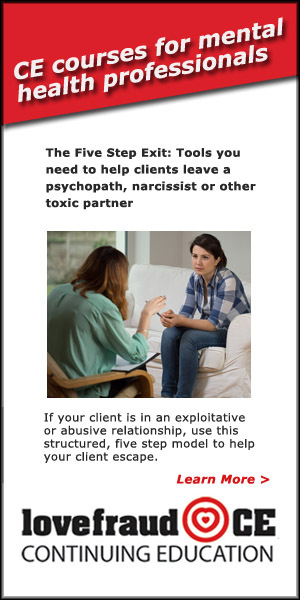 Sociopaths are everywhere, so professional resources are needed everywhere. You’ve helped me so much in dealing with my situation. I’m sure other potential clients are looking for a professional with your skill and expertise. 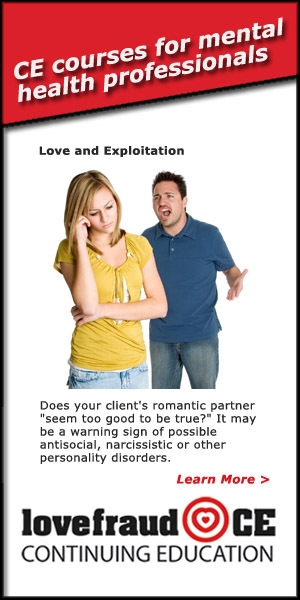 So they can find you, I suggest you join the Lovefraud Professional Resources Guide. 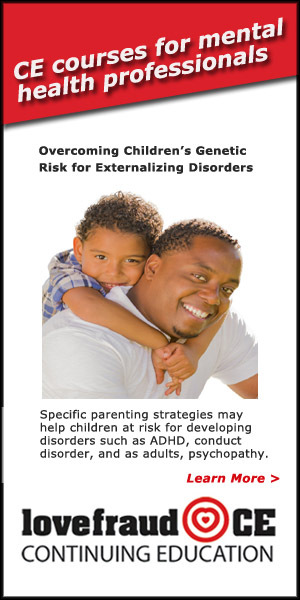 This is an online directory of professionals who are skilled at helping people escape from difficult and controlling personalities. 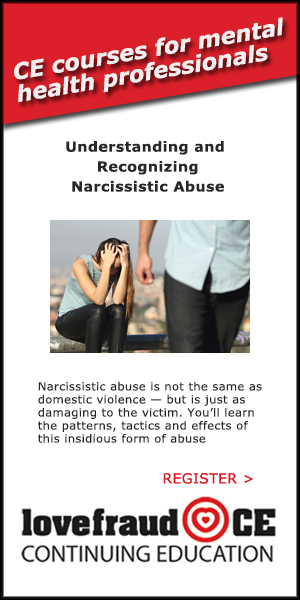 It’s part of Lovefraud.com, which has extensive information on recognizing and recovering from sociopaths. I believe you would be a valuable addition to the directory. Other people are searching for assistance so they can escape sociopaths. 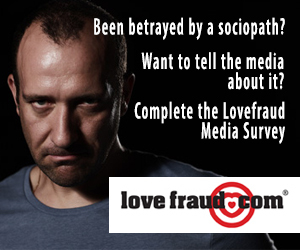 If you know a qualified professional, please send them to Lovefraud.